The DeKalb County District Attorney’s Office is currently accepting resumes for an Assistant District Attorney for its Uniform Interstate Family Support Act (UIFSA) Division. UIFSA prosecutes establishment and enforcement interstate child support cases. 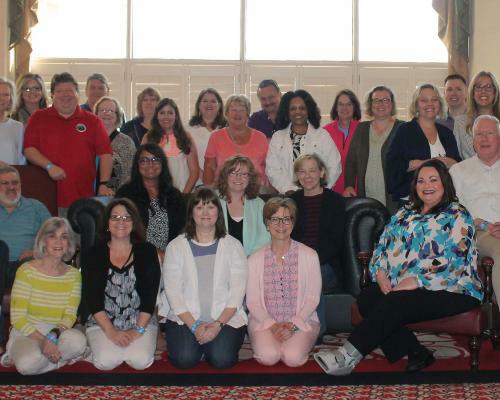 Attorneys assigned to UIFSA, represent the State of Georgia Department of Human Services, Division of Child Support Services (DCSS) in litigation matters concerning child support establishment and enforcement. Principal duties and responsibilities include, but are not limited to: researching and interpreting legal issues affecting child support enforcement litigation and other operations of the organization (DCSS); utilizing available sources and professional knowledge to prepare legal briefs, opinions and position papers substantiating the organization’s position; monitor work product of case managers and assigned administrative staff for timely and efficient processing of applicable legal workflow processes; train and advise staff on various child support related issues, including the application of the child support guidelines and worksheets and changes in the Child Support Recovery Act and UIFSA statute; review cases for bankruptcy and attend bankruptcy court as needed; attend hearings in the Office of State Administrative Hearings as needed on various administrative procedures; reviewing and analyzing case files and ensuring that information has been properly documented, and file is clearly organized for efficient prosecution; analyzing case files to determine if an obligor meets the criteria for referral to an alternative sanction program; meet with outside attorneys, obligors and obligees as needed to address child support enforcement and/or establishment concerns and to obtain child support orders; presenting cases to the Court in child support hearings; examining and preparing case managers for hearings; negotiating with opposing counsel; and other duties as assigned. The ideal candidate must be a licensed member in good standing with the State Bar of Georgia; have sufficient experience to understand the basic principles relevant to the major duties of the position. The successful candidate must have a minimum one to three years of law practice experience, preferably in civil litigationand specifically, family law related experience; must have knowledge of the Child Support Recovery Act and the State of Georgia Child Support Worksheets and Guidelines; familiarity with the UIFSA statute is a plus; and must be able to multitask and work with a high volume of files under time constraints. The successful candidate must possess excellent communication skills, both oral and written; strong organizational skills are a must, and experience with DeKalb County e-filing is a plus; interpersonal skills are necessary, with the understanding that you will be speaking with non-custodial and custodial parents from various backgrounds; must be able to work well in a team environment, while at the same time having the ability to work independently; must demonstrate a strong sense of personal responsibility; and a commitment to serving the community and working with the public. Employment is contingent upon the completion and satisfactory results of a criminal background check. Salary and benefits will be commensurate with experience. Interested candidates should email a resume, cover letter, and references by April 26, 2019, to: Kamilah Miller, Deputy Chief Assistant District Attorney, UIFSA Division, kemiller@dekalbcountyga.gov. The Program Manager provides leadership, vision and strategic direction for a child support services operation with approximately 24 staff. The main office is in Cleveland, TN, with a satellite office in Athens, TN. This individual develops procedures, processes and methods to manage the child support caseload. The Program Manager assesses operational efficiency and effectiveness and implements process improvement activities as needed. 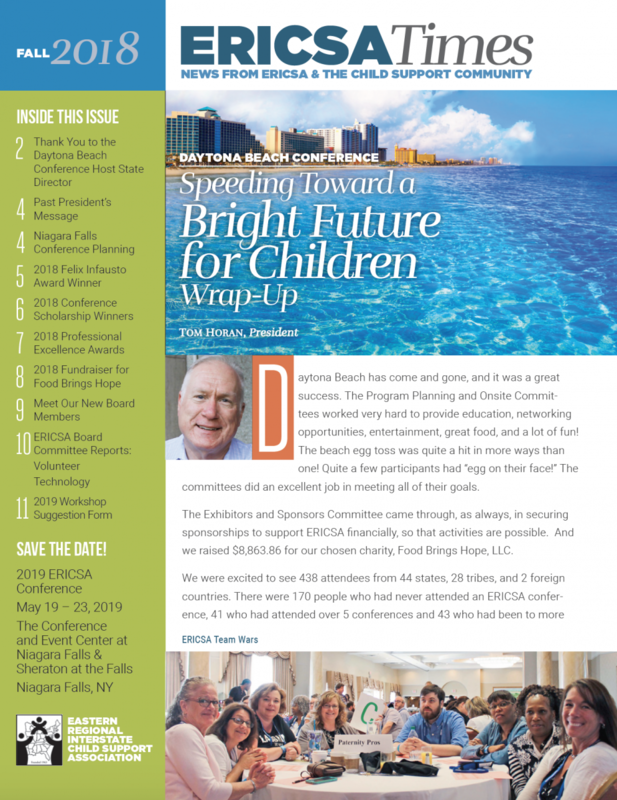 Click here to read the Winter 2019 ERICSA Newsletter. The ERICSA Nominations Committee is currently seeking nominations for the ERICSA Board. You may nominate yourself, or someone else, and all nominees must be ERICSA members in good standing. Past committee and conference involvement is strongly encouraged. The Nomination Form must be completed for all nominees. Please return the nomination form and a copy of the Nominee’s resume to Pam Sala at salap@oakgov.com no later than Wednesday, March 6, 2019. 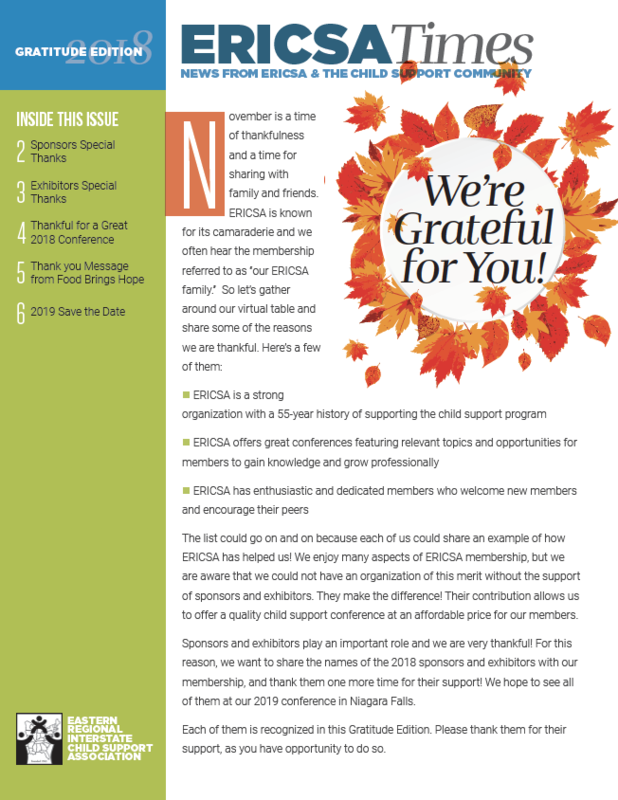 Click here to read the ERICSA 2018 Gratitude Newsletter. 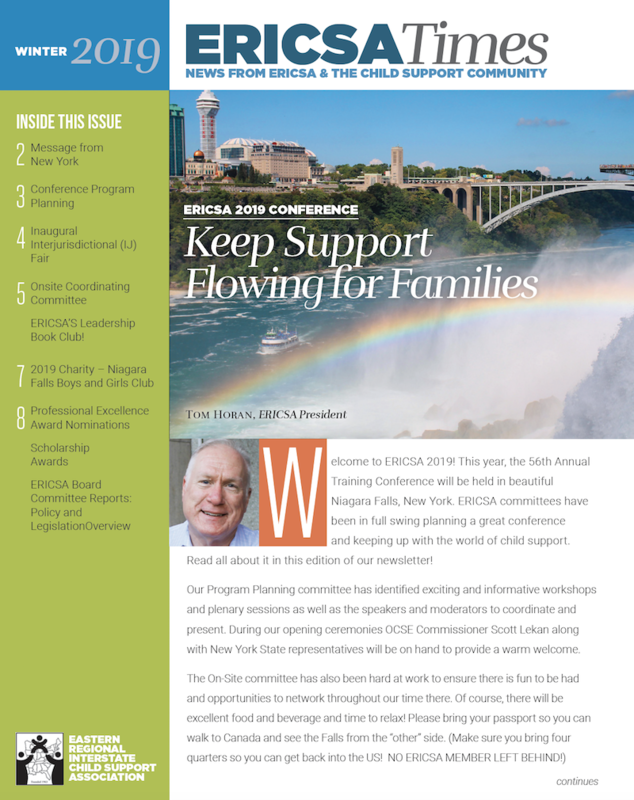 Click here to read the Fall 2018 ERICSA Newsletter. ERICSA is pleased to announce the 2018 Felix Infausto Award Winner, Rob Velcoff. Click here for more information on the Felix Infausto Award, Rob Velcoff and past winners. 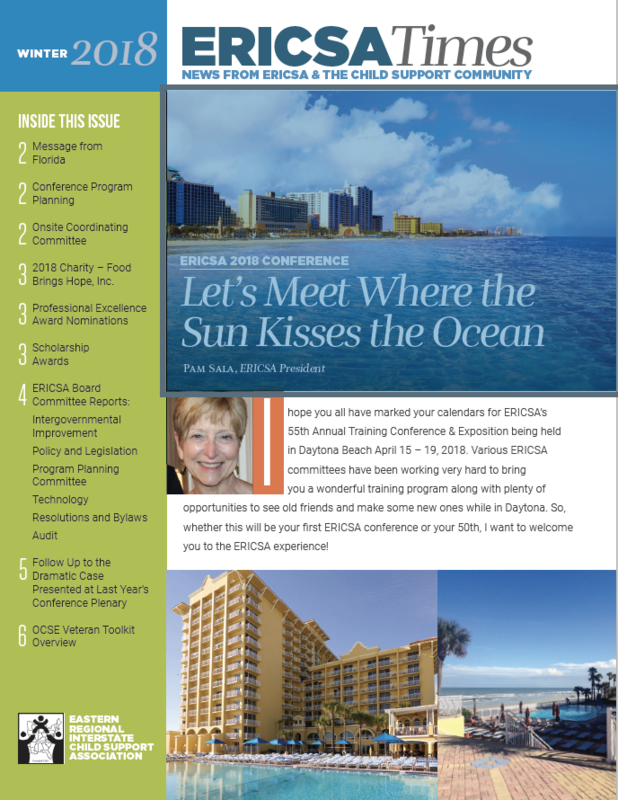 Click here to read the ERICSA 2018 Winter Newsletter.